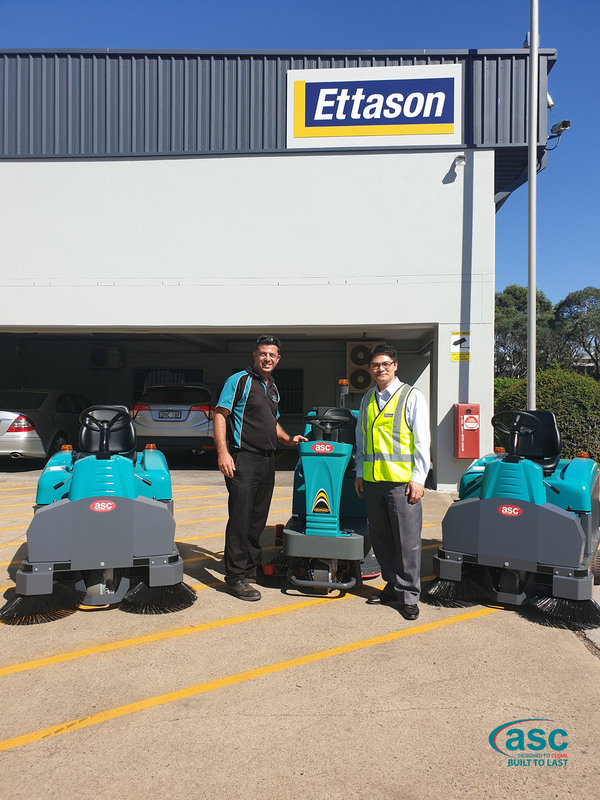 Asian Food Giant Ettason recently invested in a range of ASC floor sweepers and scrubbers for their large NSW Villawood facility. Ettason is a well known and respected Asian Food importer. Established over 30 years, Ettason imports, exports, manufactures and distributes quality Asian food brands across Australia and New Zealand. Ettason recently inquired with ASC how best to reduce the amount of dust & grime in their food production and distribution warehouses. ASC NSW Sales Manager Mr. Jason Frendo guided the Ettason management group on how ASC floor technology could be used to best maintain their floors and maintain a high HACCP standard. In the process, Ettason invested in 2 x ASC Eureka M3 Ride on Sweepers and 1 ASC Eureka E83 Ride on Scrubber. Both the management and staff are ecstatic at the both the quality of these machines and the results that they have produced. Pictured are Mr. Andy Lee(Ettason) with ASC’S NSW Sales Manager Jason Frendo.